Get your natural skin tone and clear skin! More patting you skin, more absorbing moisture! Nutrient ingredients make a tight-fisted skin layer, smooth skin texture and enduring makeup! Lemon extract with vitamin C makes tired skin luminous, and anti oxidation makes detoxification of your face. Moist luminous will fill pore and fine wrinkles. 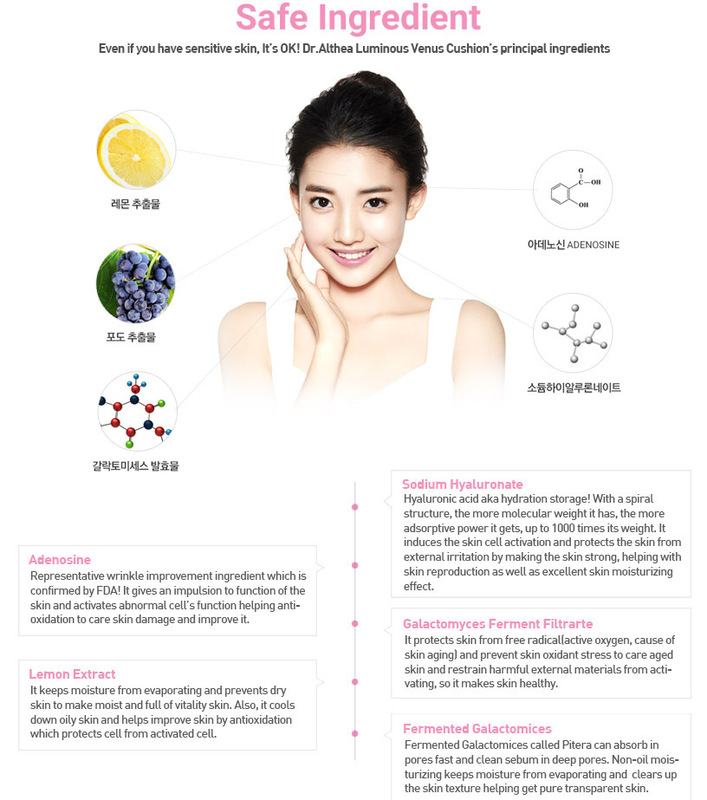 Natural extracts make your skin moist all day and voluminous soft baby face. Get powerful moisturizing, beautiful and clear skin. Hyaluronic acid hold your moisture tightly. 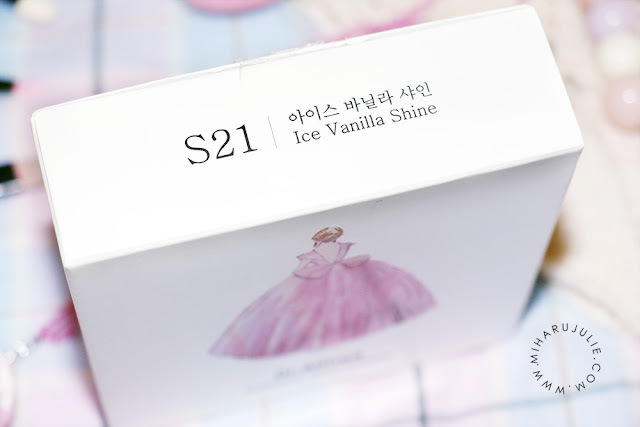 Watery and light cushion makes moisture finish and smooth glossy skin. You can get no-sticky and long lasting moisture. The box is a little bigger than the normal boxes for the any cushions. 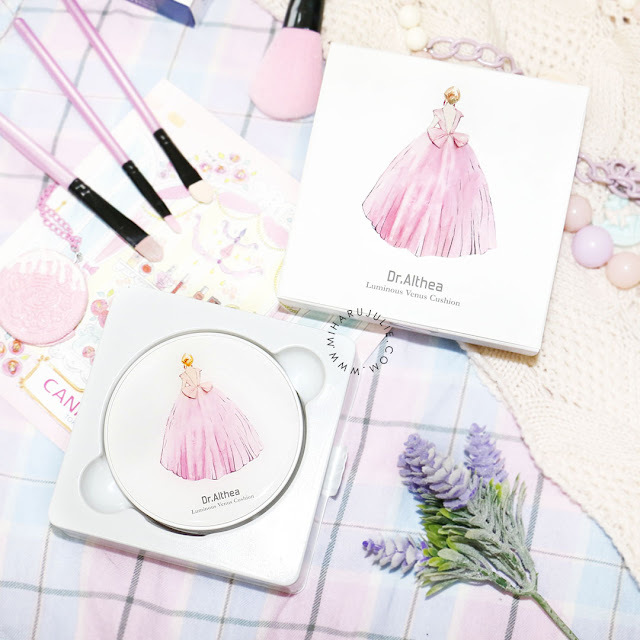 The cardboard box packaging is adorable, comes with a white packaging and has an girl in pink dresses illustration on the lid. The cushion shows the same illustration. It comes in a portable compact case, with a mirror and It also closes firmly with a click. Cushion pacts come with a ruby cell air puff applicator. The texture is pretty watery and It feels so light to the touch. Moist texture blends in easily with the skin color. 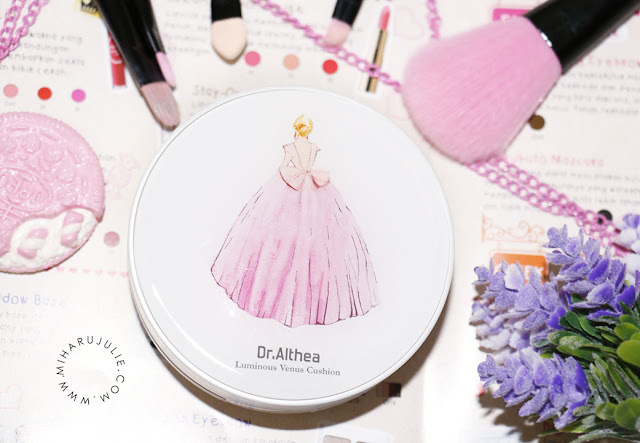 Dr. Althea Luminous Venus Cushion is a moisture finish and smooth glossy skin. You can get no-sticky and long lasting moisture. These do have soft coverage on their own if you want a natural bright look and don’t like to wear much make up. I would describe it as a soft coverage product though; it can cover light blemishes and give you a natural look. It's up to you how much product you use per application. 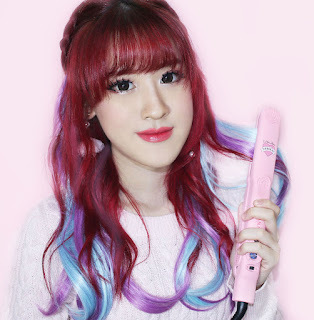 Just press harder if you want more product on your puff, press lighter if you want lessen. Thanks to the puff and the formula of the foundation it's easy to spread the product out on the face. It looks even and it won't look streaky at all. 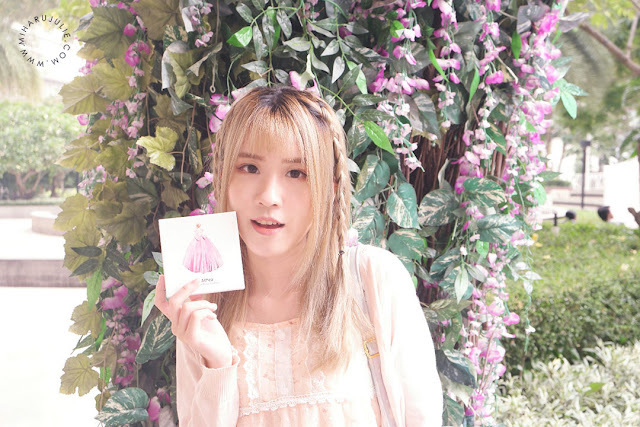 Below you can see how the Dr. Althea Luminous Venus Cushion looks on my skin. It makes the skin tone even and has medium coverage. If you have very troubled skin you will probably need a concealer. It is a dewy finish and the skin doesn’t feel dry after using it, but rather refreshed. 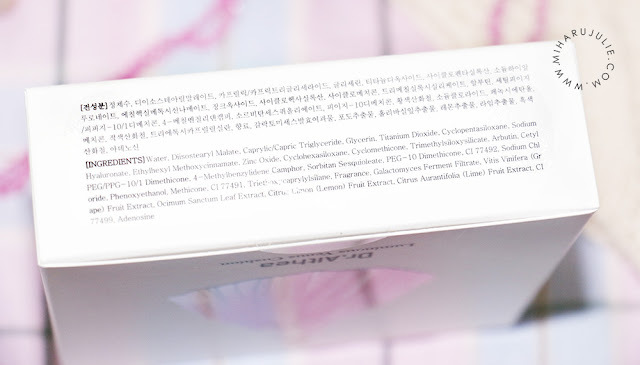 When applying, the product feels moist and it has a lovely cooling effect (great for the hot days!). The lasting power is ok, it seems to stay nice for a good 4 hours. You can easily re-apply it afterwards. 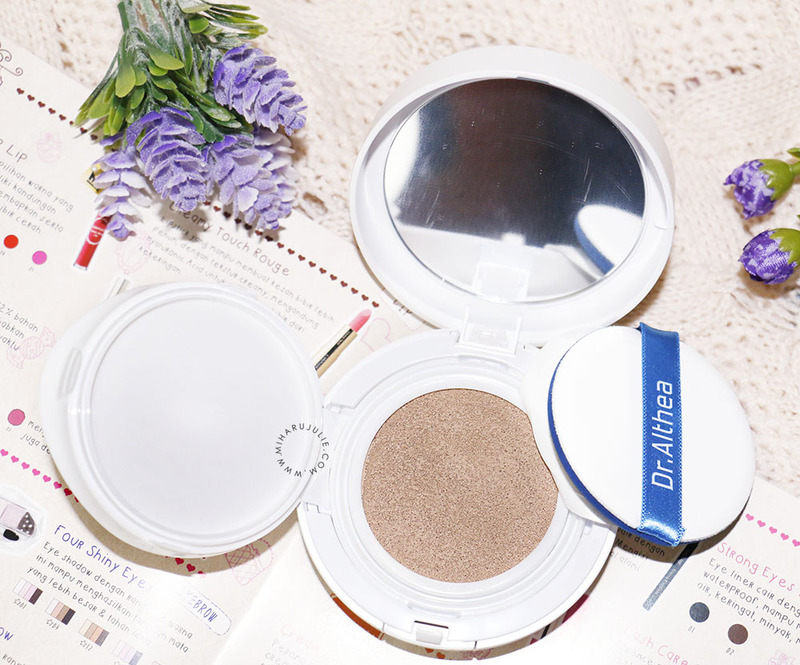 Overall, Dr. Althea Luminous Venus Cushion would be a good candidate for a daily usage. It makes the skin feel moisturized and give a natural look. I like the design of the cushion compact and the ingredients are nice. It smells nice and has many skin benefits which is nice too. I recommend this for people who have dry skin as mine.